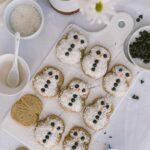 Coconut Snowmen Cookies are the cutest cookies you can make for your Christmas or New Year celebrations. Simple yet adorable both for kids and grown-ups. If it’s not snowing where you live and if you miss seeing everywhere white and can’t wait to play snowball or make a snowman, I have a great solution for you. 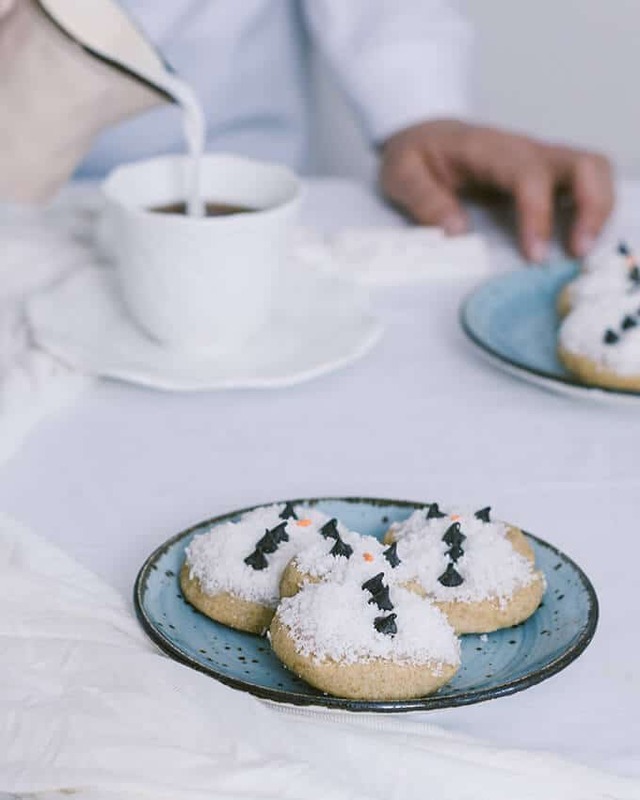 Make these lovely Coconut Snowmen Cookies and bring the snowy feeling inside your home. Isn’t it great that you don’t need to go out and your hands won’t freeze at all? When I say it’s so easy to make these cuties, I really mean it. If I can make these, anyone can. Although I love baking and trying new recipes, I’m definitely not a talented person about crafting or decorating cookies and cakes. I didn’t have any difficulty in making these coconut snowmen cookies though. It was really fun to create several little snowmen when it was freezing cold outside. 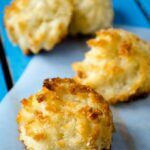 These are perfect holiday treats to make with little ones in your family too. We make a simple sugar cookie dough and form it in two logs; one small an done large for the head and the body of our snowmen. Chilled logs are sliced into rounds and combined on a parchment-lined baking sheet. The edges of rounds should stick to each other so that they form snowmen. 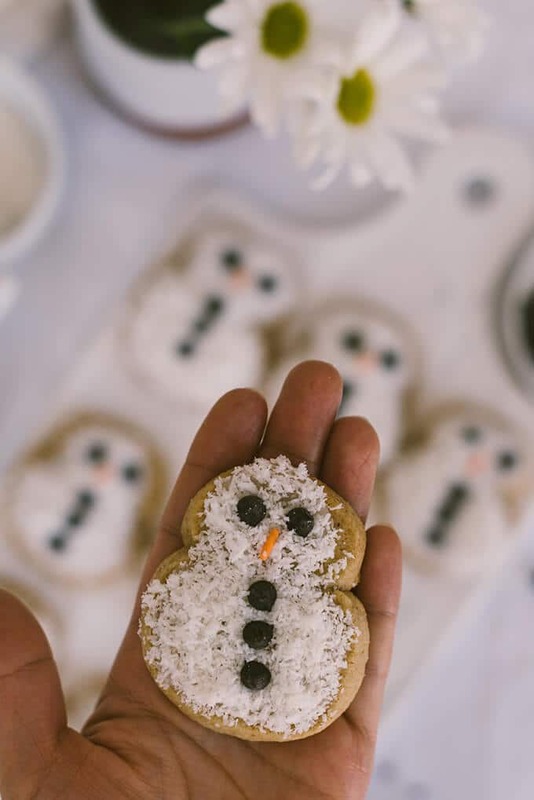 After the “naked” snowmen are cooked and completely cooled, you can dress them up with coconut snow. We need a simple glaze made of powdered sugar and milk for this. And then sprinkle coconut on the glaze when it’s still wet. Place chocolate chips for the eyes and buttons of your snowmen. Finally put an orange sprinkle for the carrot nose ( I used long sprinkles). If you are looking for edible gifts that will bring a smile to your loved ones, look no further! Why don’t you make these cookies instead of buying something? Wouldn’t it be fun to give these guys as gifts? 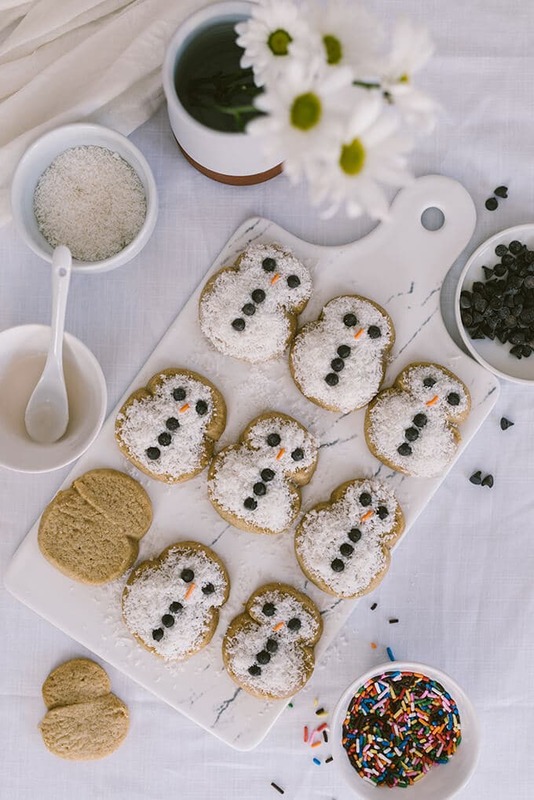 Sugar cookies easily shaped and decorated in the form of snowmen. Perfect holiday project for the whole family. In a large bowl, beat butter and sugars with an electric mixer or a whisk. Add in salt, egg yolk and vanilla extract and beat until combined. Add in flours and stir until dough forms. Divide the dough into 2 pieces, 1 twice as large as the other. Roll each into a log, wrap tightly in plastic wrap. Refrigerate logs for 2 hours. Slice each log into 1/4-inch-thick rounds. Place 1 large round and then 1 small round right above the large one so that the edges stick to each other. Repeat with the remaining rounds. Bake 17-20 minutes or until the edges are golden, switching and rotating sheets halfway through baking. Let the cookies cool on sheets for 10 minutes and then transfer them to a wire rack, let them cool completely before decorating. Whisk powdered sugar and milk together. 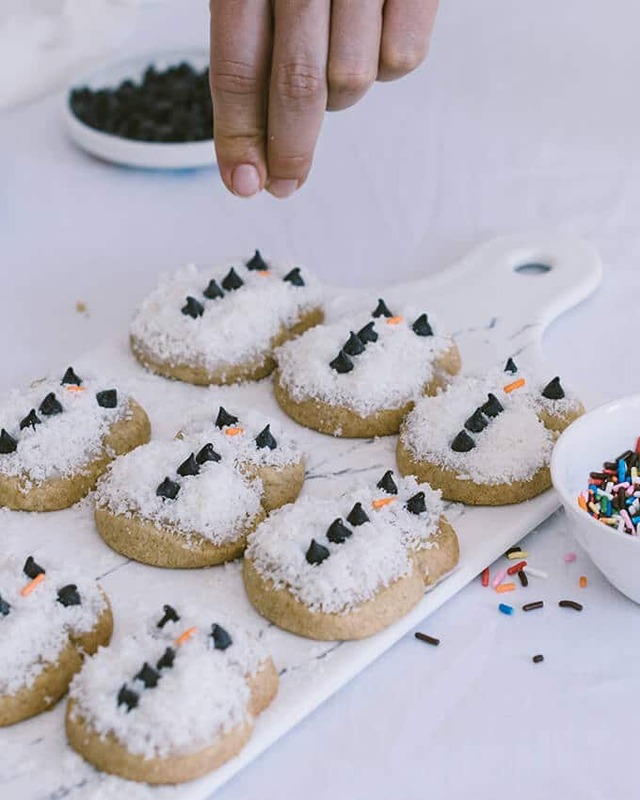 Working with 1 cookie at a time, spread 1 teaspoon of glaze evenly onto a cookie, then sprinkle with coconut and decorate with chocolate chips and sprinkles. Let the glaze dry completely before serving. Recipe slightly adapted from America’s Test Kitchen. Such lovely cookies and pictures! My kids would love them ! Thank you Alia! They are giving a Christmas feeling, aren’t they?